HALBAN The German University of Technology in Oman (GUtech) has launched a part-time double-degree MBA programme in cooperation with Vienna University of Economics and Business (WU) in Austria. The study-programme will start this year. “The MBA programme came to complement the undergraduate programmes that we are currently offering and to fill a gap in the post graduate market in Oman,” said Prof. Dr. Heba Aziz, Dean of the Faculty of Business and Economics at GUtech and Academic Director of the newly launched MBA programme. Established in 1898 and founded as the Imperial Transport University, Vienna University of Economics and Business is one of the largest and leading business universities in Europe. The university has a well-established, very international student and academic body. “International mobility of faculty and students is part of our institution. Working on an educational level together with Oman will enhance our cooperation on a business level as well,” said Prof. Dr. Barbara Stöttinger, Dean of Vienna University of Economics and Business, the WU Executive Academy. The MBA will cover general management topics such as entrepreneurship, finance, marketing and logistics. “The MBA has been designed for students who have demanding full-time jobs and are in managerial positions. We are looking forward to linking the Omani society and GUtech with Austria and enable the MBA students to study a modul at our university. GUtech is planning to offer the MBA on part-time over a period of 18 months; modules will be taught four days a week from Thursday to Sunday. The MBA will offer specialisations in the fields of logistics, tourism and entrepreneurship,” said Dr. Astrid Kleinhanns-Rollé, Managing Director of the WU Executive Academy. 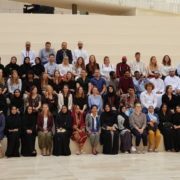 HALBAN A group of 44 students and their professors from Tourism Management Departments of the Cologne Business School (CBS) and the University of Applied Sciences in Stralsund (HOST) in Germany visited GUtech. Students and staff members of the Department International Business Management (IBSM) welcomed the group. During the joint programme at GUtech, the students presented their study-programmes and the locations of each university as well as tourism in Germany and in Oman. The programme also included ice-breaker activities in small groups, a campus tour and a student photo exhibition. Professor Dr. Heba Aziz, Dean of the Faculty of Business and Economics stressed in her speech that the cooperation between GUtech and the University of Applied Sciences in Stralsund was the first cooperation of the department established in 2011. Since then several Omani students have studied at HOST. In exchange GUtech offers internships for one semester for Master’s students or a semester in the Bachelor of International Business and Service Management. “I would like to conduct an internship at GUtech and to be involved in research,” said Kristin Beyeler, who is currently studying in her 1st semester, MA Tourism Development Strategies at HOST. Alexandra Flimm, CBS student in the Bachelor of International Tourism Management said that the Omani students are very open-minded and welcoming and that she would like to study one semester at GUtech. “Our excursion to Oman offers an intercultural experience with visits of the university and different companies as well as field-trips around the country,” said Prof. Dr. Volker Rundshagen, Head of General Management, Leisure and Tourism Management at HOST. 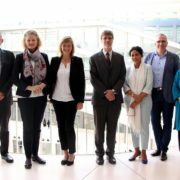 “The visit to GUtech enhances our cooperation and the exchange of students and staff between both universities,” stressed Steffi Schnierer, Programme Manager and Lecturer at HOST. Dr. Desmond Wee, Dean and Professor for Tourism Management at CBS said that he would like to invite GUtech students to participate in an upcoming five-day international project seminar, a ‘Hotel Placement Simulation’, where students will learn how to set-up a hotel in an interactive environment along with other students from Estonia, UK and Belgium. “Before establishing a hotel, it is important to think about the cultural, social and environmental sustainability of the project,” he said. For many students from Germany, it is their first travel to the Arabian Peninsula. “This excursion is my first travel outside Europe. In future, during the 5th semester, I would like to study for one semester in Mexico, Peru or in Argentine. After my studies I would like to work on a cruise liner,” said Emilio Anzini, who studies a BA Intercultural Tourism Management at CBS. Around 1,400 students from 75 countries are studying at CBS in Cologne that was founded in 1993. The university is embedded in a large network of partnerships with around 100 universities all over the world and numerous international companies. At HOST which is located in the far North of Germany, on the Baltic coast, 2,200 students from around the world are studying in 27 programmes. HOST has international cooperations with universities in Cyprus, Sweden, Turkey, Italy, France and Bali. As a study incentive for international students, the city of Stralsund offers 150 Euros to each student at the beginning of their studies, said Ammar Saeb, who studies in the Master’s programme Tourism Development Strategies at HOST. HALBAN The Dean’s List Award Ceremony was held in the large GUtech amphitheatre to celebrate the achievements of 55 GUtech students and to commemorate the 6th anniversary of His Majesty’s visit to the university. “We only recently introduced the Dean’s List as a way to recognize outstanding academic achievements. The Dean’s List is a very enviable accomplishment that is only given to our top students” said Prof. Dr. Armin Eberlein, Vice-Rector for Academic Affairs. 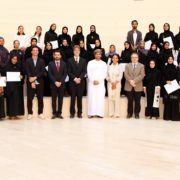 The criteria for the award were an outstanding academic achievement, the top 10% of the students, a minimum GPA of 3.5, registered for a minimum of 25 credit points, no incomplete or failing grades, no disciplinary written warning letters and an IELTS 6.0 or equivalent. Dr. Armin congratulated the students along with the Head of each academic Department. “You should be proud of the award. You worked hard, attended many lectures, and in addition spent many hours studying on your own or in groups. And it paid off. Your efforts were worth it. However, efforts alone are not sufficient to get on the Dean’s List. You also need to have the intellectual abilities that are needed for this distinction. You need to have the skills to work through complexities, solve problems, find solutions and communicate them well. Today you are being recognized for this combination of your efforts and your skills,” said Dr. Armin. Moreover, the Vice-Rector for Academic Affairs stressed that the university commemorates the 6th anniversary of the visit of His Majesty Sultan Qaboos bin Said al Said to GUtech. On the 24th of December His Majesty honoured the university with a special private visit. “We are proud of His Majesty’s recognition of our achievements. It shows how His Majesty values us as individuals, our university, our educational ethos, and the benefits that we as an institution bring to the country of Oman. Ultimately, it is through you, our students that GUtech contributes to Oman. You get a superb education here at GUtech. In a few years when you join the workforce, you will be the ones who add value to the Omani economy. And this is what makes me proud of being part of GUtech. It allows me to not only educate individuals for the sake of getting a degree, but I can help develop the future leaders of Oman. This is a real privilege,” said Dr. Armin Eberlein. Many GUtech students and friends attended the ceremony. Finally one GUtech student mentioned that this award ceremony serves as a motivational event for other students to study hard in order to be part of the list next year. HALBAN As part of the regular ‘Tuesday Tourism Talks’ organized by the Faculty of Economics and Business of the German University of Technology in Oman (GUtech), the faculty will host Samih Sawiris during an evening event held at the Kempinski Hotel Muscat on 19 November, 7 pm. Samih Sawiris is one of Oman’s leading tourism investors and a leading international figure in the field of tourism and investment. “We are honored to announce this special conversation with Samih Sawiris next week. As the founder and Chairman of Orascom Development Holding (ODH.SW) he has established along with Omran two major integrated tourism projects in Oman, Jabel Sifah located in Muscat and in Hawana Salalah in Dhofar. During the upcoming talk Samih Sawiris will reflect and share insights of his extensive experience as an investor in the tourism industry worldwide, creating destinations through ‘place making’,” said Prof. Dr. Heba Aziz, Dean of the Faculty of Economics and Business at GUtech. Orascom Development’s diversified portfolio of destinations is spread over nine jurisdictions (Switzerland, Egypt, Montenegro, Oman, UAE, Jordan and Morocco). The Group currently owns 35 hotels, with 8,135 guestrooms and over 1,000 rooms under development in the different countries. ODH operates eight destinations; Andermatt in Switzerland, Four in Egypt: El Gouna, Taba Heights, Haram City and Makadi in Egypt; The Cove in United Arab Emirates, Jebel Sifah and Salalah Beach in Oman, Andermatt in Switzerland and Lustica Bay in Montenegro. 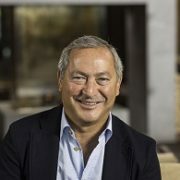 Samih Sawiris is also a major shareholder of Orascom Construction Industries (OCI N.V.), a Dutch based global producer of natural gas-based chemicals and engineering and construction contractor with projects and investments across Europe, the Americas, Asia, the Middle East and North Africa. He is also a significant stakeholder in Lafarage (LG.FP); a world leader in building material and major player in the cement, aggregates and concrete industries, operating in 64 countries and listed on the Paris Stock Exchange. In addition, Samih Sawiris is part of the Sawiris Foundation, a prominent institution of economic and social aid in Egypt that provides job opportunities, trainings and placement of qualified Egyptians in the job market as well as scholarships in various colleges and universities. 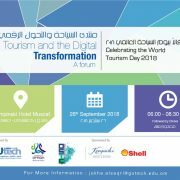 In celebration of the World Tourism Day 2018, the Faculty of Business and Economics at GUtech in collaboration with the Ministry of Tourism in Oman will hold a forum on “Tourism and the Digital Transformation” on the 26th of September at the Kempinski Hotel Muscat, between 6 – 8.30 pm, followed by dinner. 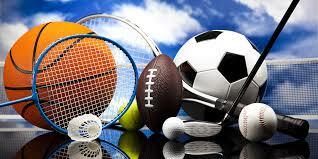 “The event is sponsored by the Kempinski Hotel and Shell Oman to whom we are very grateful. The forum will present testimonials on how the tourism sector worldwide has been shaped by the Fourth Industrial Revolution. A leading panel of international and national experts will be discussing their recent initiatives in heritage, hospitality, tourism development, marketing and quality assurance in an interactive and concise forum,” said Prof. Dr. Heba Aziz, Head of the Department of Logistics, Tourism and Service Management at GUtech. Technologies are emerging, disrupting and affecting our lives in ways that indicate we are at the beginning of a Fourth Industrial Revolution, a new era in which digitalization builds and impacts societies in new and often unanticipated ways. It is worthwhile considering exactly what kind of shifts we are experiencing and how we can ensure, collectively and individually, that this revolution creates benefits for all. Tourism was one of the first sectors to digitalize business processes on a global scale, bringing flight and hotel booking online to become a digital pioneer. As information and communications technology (ICT) became a global phenomenon, tourism was a consistent early adopter of new technologies and platforms. Digitalization of the tourism sector influenced business and consumer alike and required a complete paradigm shift in the sector. Disintermediation meaning the gradual disappearance of the travel agencies and the move of the tourism sector into a business to consumer model. This might have led to loss of business on one hand, but has on the other created many others. Another interesting development is in the area of the power of the consumer, the wisdom of the crowd has now replaced quality assurance agencies, consumer is no longer interested in how many stars the hotel have but rather on the quantity and quality of reviews on tripadvisor. “Harnessing innovation and digital advances provides tourism with opportunities to improve inclusiveness, local community empowerment and efficient resource management, amongst other objectives within the wider sustainable development agenda”, said UNWTO Secretary-General Zurab Pololikashvili in his message for the World Tourism Day 2018. The programme of International Business and Service Management (IBSM) is one of GUtech’s fastest growing programme of studies. The programme of study focuses on the tourism sector from an international and national perspective. More information on the forum can be found on the GUtech website. HALBAN The Faculty of Business and Economics at GUtech has recently formed a student club entitled Oman Sustainable Tourism Club (OSTC). The department of Logistics, Tourism and Service Management is planning for the official launch of the club to take place on 27 September, on the occasion of the World Tourism Day. “The club members who are now around 20 have been very active and enthusiastic about the various activities and initiatives they plan to carry out. So far the students have designed their own website, a communication campaign with a logo, I am so proud of them,” said Prof. Dr. Heba Aziz, Head of the Faculty of Business and Economics. 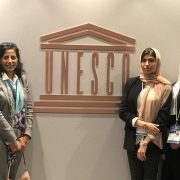 In addition, some members of the student club have volunteered in the 42nd Session of the UNESCO World Heritage held in Bahrain, between the 24 June and the 4 July. The students had the opportunity to witness the inscription of Qalhat as a World Heritage Site with lots of joy and happiness and they celebrated this great achievement. The World Heritage Committee gathers representatives from over 100 countries concerning the Protection of the World Cultural and Natural Heritage elected by the General Assembly of States Parties to the Convention. “This event is a major international UNESCO conference with over 1000 delegates participating to decide on the listing of cultural heritage sites on the World Heritage list. It is a wonderful experience for the students to be exposed to such major important events,” said Prof. Dr. Heba Aziz. During the conference the GUtech students worked as part of an international body of students volunteers. The students showed interest in being part of such event in the future in order to be able to represent the Sultanate of Oman and GUtech.